With all the frock coats projects I have done lately (Four Coat, Five Coat, Six Coat), I have become more attuned of the cut and style of such garments. 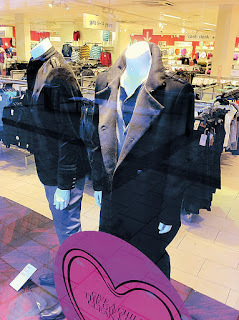 It was funny then to see a coat in the window of H+M as I passed on my way to college last week (see right). As well as being 3/4 length; having large lapels; and a stand-up collar, it displayed the distinctive waistline seam running around the coat from front edge to front edge - something I see as frock coat essential! This warranted further investigation, so I went back to take a closer look after class. The coat is made from black cavalry twill, which (as its name suggests) is often used for military uniforms, though this is a cotton rather than a wool. The buttons are metal, pewter-like with a coat of arms. The stand-up collar and pocket flaps are edged with a double strip of black silk ribbon, as are the epaulets on the shoulders. The cuffs are rather spectacular! Usually cuff (on a suit) have a few token buttons sewn on the back edge; a more expensive suit will have a small vent and a surface sewn, but not practical buttonhole under the button; a fully tailored jacket may well have the vent, but with fully working buttons and holes, though for little actual use. This coat has this with five full-sized practical buttons and holes! Very nice. Sadly the outer pockets are just large patch-pockets rather than being set into the waistband seam, and the back of the coat does not have the distinctive curved seams as on all the frock coats I have worked on. Nonetheless, it is a great coat (pardon the pun) and as well as having the styling of a frock coat, it also reminds me on the military style coat Matt Smith wore for the publicity tour prior to the premiere of Series Five. Lastly a lot should be said about the price - a mere £69.99! Can’t go wrong! Though a word of warning: when I bought mine two of the front buttons were missing, which I found had been put in one of the pockets. This wasn't an issue for me - after all I know how to sew a button on! But while doing so I found one of the other buttons loose, so had to reattach that as well. While I was in button-sewing mode, I decided to take e two spare buttons provided and attach them to the back, making the coat even more frock coat styled. I can now step out in pride!! !